Birds (class Aves) are bipedal, warm-blooded, oviparous (egg-laying) vertebrates characterized primarily by feathers, forelimbs modified as wings, and a bony beak without teeth. Common characteristics of birds include the laying of hard-shelled eggs, high metabolic rate, and a light but strong skeleton, generally with hollow bones. The only animals covered with feathers, most birds are characterized by flight. Many birds migrate long distances to utilize optimum habitats (e.g., Arctic tern), while others spend almost all their time at sea (e.g., the wandering albatross). Some, such as frigatebirds, stay aloft for days at a time, even sleeping on the wing. The fastest living animal is a bird, the peregrine falcon (Falco peregrinus), which has been observed to reach a flying speed of at least 124 mph (200 km/h) and perhaps 350 km/h (217 mph) during a dive. On the other hand, the ratites are flightless, and several other species, particularly on islands, have also lost this ability. Flightless birds include the penguin, ostrich, kiwi, and the extinct dodo. Birds range in size from the tiny hummingbirds to the huge ostrich and emu. Depending on taxonomic viewpoint, there are about 8,800 to 10,200 living bird species in the world, making them the most diverse class of terrestrial vertebrates. The path of humans and birds have intersected in many ways throughout human culture, whether directly through hunting and domestication, or as powerful symbols in literature, arts, and religion. The dove has been used as a symbol of peace and love, as well as the Holy Spirit in Christianity; cranes have symbolized long life, and owls wisdom. The majority of birds are monogamous and many species mate for life, reflecting the higher aspirations of the human spirit and religion. Birds are a very differentiated class, with some feeding on nectar, plants, seeds, insects, rodents, fish, carrion, or other birds. Some birds even feed on parasites on black rhinoceroses, or within the mouths of crocodiles. Most birds are diurnal, or active during the day. Some birds, such as the owls and nightjars, are nocturnal or crepuscular (active during twilight hours). Many birds seasonally migrate long distances, improving opportunities for food, better climate, and breeding. Birds are among the most extensively studied of all animal groups. Hundreds of academic journals and thousands of scientists are devoted to bird research, while amateur enthusiasts (called birdwatchers or birders) probably number in the millions. 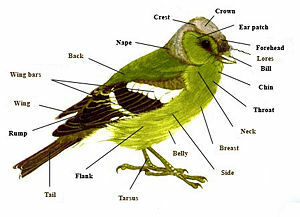 Birds form a class, whose scientific name is Aves. Modern birds are classified in the subclass Neornithes, which is further separated into two superorders, the Paleognathae (mostly flightless birds), and the wildly diverse Neognathae, containing all other birds. There is also an extinct subclass, Archaeornithes. The paleognaths include the tinamous (found only in Central and South America) and the ratites. The ratites are large flightless birds, and include ostriches, cassowaries, kiwis, and emus. Some scientists suspect that the ratites represent an artificial grouping of birds which have independently lost the ability to fly, while others contend that the ratites never had the ability to fly and are more directly related to the dinosaurs than other modern birds. The classification of birds is a contentious issue. 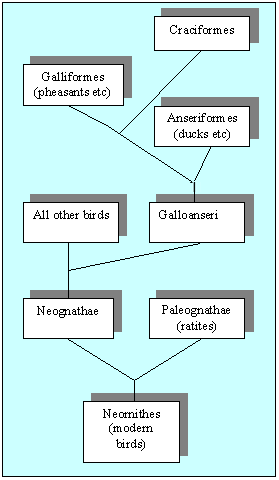 Sibley and Ahlquist's Phylogeny and Classification of Birds (1990) is an often cited work on the classification of birds, but is also frequently debated and constantly revised. Evidence has been accumulated that the modern bird orders constitute accurate taxa. However, scientists are not in agreement as to the relationships between the orders; evidence from modern bird anatomy, fossils and DNA have all been brought to bear on the problem but no strong consensus has emerged. Some postulated the Galloanseri (see chart) as the basal divergence from the remaining Neognathes. The Galloanseri contain the Anseriformes (ducks, geese and swans), and the Galliformes (the pheasants, grouse, and their allies). While there is general consensus that the orders Anseriformes and Galliformes represent sister-groups, there remain opposing points of view. This is a list of the taxonomic orders in the class Aves. The list of birds gives a more detailed summary, including families. Note: This is the traditional classification (the so-called Clements order). A more recent, substantially different classification based on molecular data has been developed (the so-called Sibley order) and is gaining acceptance. The estimated number of living bird species is often put around ten thousand, but ranges from 8,800–10,200. This compares to about 4,800 species of mammals and 7,150 species of reptiles. Birds have adapted to virtually every part of the globe and a wide diversity of habitats: forests, grasslands, cities, mountains, deserts, wetlands, and oceans. Even the snowy owl (Bubo scandiacus) is adapted to live north of the Arctic Circle, where the temperature can be below -46°C during the winter, and penguins thrive in the Antarctica. The albatrosses spend much of their time soaring over the open ocean, and the emperor penguin (Aptenodytes forsterican) plunges to depths of more than 250 meters (850 feet) searching for food. However, birds have generally been adapted to terrestrial land—only two percent of all birds are aquatic. Most of these, about 150 species, are duck like birds, as well as a small number of grebes (20), loons (4), penguins (15), and auks (21) (Mayr 2001). Additionally, only a few birds are leaf-eaters, with a notable one being the hoatzin (Ophisthocomus hoazin). A distinguishing feature of birds is feathers. Other animals have wings and can fly, such as bats, but only birds are covered with feathers. Feathers are among the most complex structural organs found in vertebrates. These integumentary appendages are formed by controlled proliferation of cells in the epidermis (outer skin layer) from a protein called keratin. These fibrous structural proteins form the hard, but non-mineralized structures found in bird feathers, beaks, and claws, as well as reptilian claws, shells, and scales, and mammalian hair (including wool), nails, claws, horns, and hooves of mammals. The β-keratins used by birds and reptiles are even tougher than the α-keratins of mammals. Feathers insulate birds from water and cold temperatures. Individual feathers in the wings and tail play important roles in controlling flight. Color patterns serve as camouflage against predators for birds in their habitats, and by predators looking for a meal. Striking differences in feather patterns and colors are part of the sexual dimorphism of many bird species and are particularly important in selection of mating pairs. The blue and green colors in most parrots are attributed to a texture effect in microscopic portions of the feather itself, rather than pigment. Birds also have skeletons possessing unique characteristics. 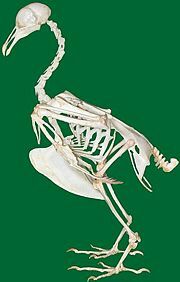 The skeleton of a dove. The avian (bird) skeleton is highly adapted to these animals' capacity for flight. It is extremely lightweight, but strong enough to withstand the stresses that a bird experiences when taking off, flying and landing. One of the adaptations that make this possible is the fusing of bones that are separate in mammals into single ossifications. Because of this, birds usually have a smaller number of bones than mammals or reptiles, and the frame has more strength. Birds have many bones that are hollow, with criss-crossing struts or trusses (cross walls) for structural strength. (Some flightless birds like penguins have only solid bones, however). The number of hollow bones varies from species to species, though large gliding and soaring birds tend to have the most. Birds also have more cervical (neck) vertebrae than many other animals; most have a highly flexible neck that consists of 13-25 vertebrae. Although the neck is flexible, most of the skeleton is rather stiff. Birds are the only vertebrate animals to have a fused collarbone (the furcula or wishbone) or a keeled breastbone (or sternum). The heaviest and strongest bone is the coracoid. Although feathers are light, a bird's plumage weighs two or three times more than its skeleton, since many bones are hollow and contain air sacks. The lack of teeth also lightens the frame. The pectoral (breast) muscles of birds are the largest, and may account for 20% of a bird's weight. A bird's digestive system extends from the mouth, through the pharynx, into the esophagus, into the stomach, through the small intestine and the large intestine, and out the cloacal opening. Some birds have a crop, which is a storage pouch that is part of the esophagus and can allow birds to feed and store food until later digestion. Most birds have a stomach made of two parts, the first part, or proventriculus, which secretes digestive fluids, and the second, the gizzard. Lacking teeth, birds use their digestive system to grind and pulverize food. The ventriculus or gizzard is composed of four muscular bands that act to rotate and crush food by shifting the food from one area to the next within the gizzard. Depending on the species, the gizzard may contain small pieces of grit or stone that the bird has swallowed to aid in the grinding process of digestion. For birds in captivity, only certain species of birds require grit in their diet for digestion. The use of gizzard stones appears to be a similarity between birds and dinosaurs, based on trace fossils of gizzard stones called gastroliths. The high metabolism of birds necessitates an effective system for acquiring a great deal of oxygen. the posterior air sacs (posterior thoracics and abdominals). First exhalation: air flows from the posterior air sacs to the lungs. Second inhalation: air flows from the lungs to the anterior air sacs. Avian lungs do not have alveoli, as mammalian lungs do, but instead contain millions of tiny passages known as parabronchi, connected at either ends by the dorsobronchi and ventrobronchi. Air flows through the honeycombed walls of the parabronchi and into air capillaries, where oxygen and carbon dioxide are traded with cross-flowing blood capillaries by diffusion. Birds have four-chambered hearts, and a circulatory system with blood vessels. 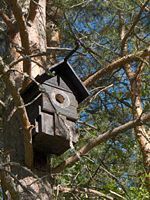 Birds' high metabolism requires rapid circulation because of the quick build up of waste products, and need for oxygen. In general, birds generally have exceptional vision, well-developed hearing, and a poor sense of smell. As a group, their vision is the best of all animals. Large eyes, often heavier than their brain, offer strong visual acuity and color perception. However, Kiwi, flightless, nocturnal birds endemic (native) to New Zealand, are nearly blind. 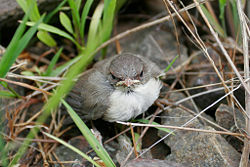 They rely on a highly developed sense of smell, with nostrils at the end of their long bill. Most birds do not have a good sense of smell. Hearing is generally well developed. For example, even without light, or any visual cues, barn owls can track their prey by sound. Birds are both endothermic (create their own heat) and homeothermic (maintain a constant internal temperature). They also generally maintain a higher body temperature than mammals, with a temperature generally between 40 and 44°C. About eighty percent of bird species maintain higher temperature than all but 10% of mammal species. Birds also generally have a faster heart rate and a greater need for oxygen than mammals, and have a higher metabolic rate. Smaller birds generally have a higher metabolism than larger birds, and have relatively higher energy needs. A hummingbird must feed almost constantly during the day, whereas an emperor penguin goes more than two months without feeding while incubating the couple's egg. After the eggs hatch, parent birds provide varying degrees of care in terms of food and protection. Precocial birds—those that are relatively mature at birth—can care for themselves independently within minutes of hatching. Altricial hatchlings—those born helpless—are blind and naked, and require extended parental care. The chicks of many ground-nesting birds, such as partridges, chickens, and waders, are often able to run virtually immediately after hatching; such birds are referred to as nidifugous. The young of hole-nesters, on the other hand, are often totally incapable of unassisted survival. The process whereby a chick acquires feathers until it can fly is called "fledging." The three mating systems that predominate among birds are polyandry, polygyny, and monogamy. 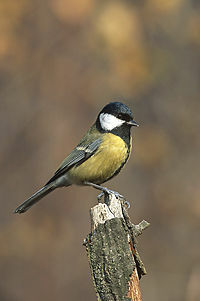 Monogamy (having one partner for reproduction and raising the young) is seen in approximately 91% of all bird species. Polygyny (one male with more than one female) constitutes 2% of all birds, and polyandry (one female with more than one male) is seen in less than 1%. Monogamous species of males and females pair for the breeding season. In some cases, the individuals may pair for life. For example, the albatross, bald eagle, and Canadian goose, as well as species of macaws, owls, and crows, mate for life. When the mate dies, there is often a re-mating of the surviving bird. There are instances of one bird showing signs of distress upon the death of a mate, although when the mate is removed from the sight of the survivor, this behavior subsides. One explanation for the high rate of monogamy among birds is the fact that male birds are just as adept at parental care as females. In most groups of animals, male parental care is rare, but in birds it is quite common; in fact, it is more extensive in birds than in any other vertebrate class. In birds, male care can be seen as important or essential to female fitness. "In one form of monogamy, such as with obligate monogamy, a female cannot rear a litter without the aid of a male" (Gowaty 1983). 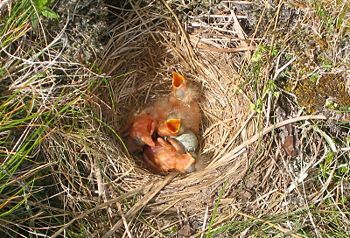 The parental behavior most closely associated with monogamy is male incubation. Interestingly, male incubation is the most confining male parental behavior. It takes time and also may require physiological changes that interfere with continued mating. For example, in the case of the emperor penguin, after the female penguin lays its egg, she returns to the sea to feed for two months to replenish her nutritional reserves. During this time, the male incubates the egg in its brood pouch for about two months consecutively without food. 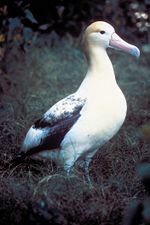 If the chick hatches before the mother's return, the father feeds it a substance produced by a gland in his esophagus. Throughout the ages, birds have been integral to human culture, whether as food, pets, bird products, or inspiration for paintings, literature, and religion. Unfortunately, hunting, destruction of habitat, and pollution have also caused many birds to be placed on lists as endangered or threatened species. There are also an estimated (plus about 120–130 that have become extinct in the span of human history. Birds are an important food source for humans. The most commonly eaten species is the domestic chicken and its eggs, although geese, pheasants, turkeys, and ducks are also widely eaten. Other birds that have been utilized for food include emus, ostriches, pigeons, grouse, quails, doves, woodcocks, songbirds, and others, including small passerines, such as finches. At one time swans and flamingos were delicacies of the rich and powerful, although these are generally protected now. Birds have served as a food source since prehistoric times. Eventually, people were able to domesticate birds, including chickens, ducks, and turkeys. Birds have also provided products for use in human societies, such as feathers and skins. 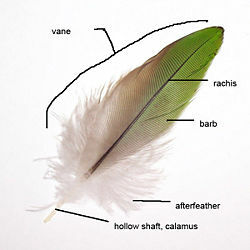 Feathers have been used for pillows and for clothing, and skins for warm, waterproof clothing and blankets. Numerous species also have come to depend on human activities for food and are widespread to the point of being pests. For example, the common pigeon or Rock Dove (Columba livia) thrives in urban areas around the world. In North America, introduced House Sparrows, Common Starlings, and House Finches are similarly widespread. Humans have long used birds to perform various tasks. For example, Homing pigeons were commonly used to carry messages before the advent of modern instant communications methods (many are still kept for sport). Falcons are still used for hunting, while cormorants are employed by fishermen. Chickens and pigeons are popular as experimental subjects, and are often used in biology and comparative psychology research. As birds are very sensitive to toxins, the canary was historically used in coal mines to indicate the presence of poisonous gases, allowing miners sufficient time to escape without injury. 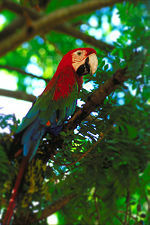 Colorful, particularly tropical, birds (e.g., parrots, and mynahs) are often kept as pets although this practice has led to the illegal trafficking of some endangered species. CITES, an international agreement adopted in 1963, has considerably reduced trafficking in the bird species it protects. Birds have been prominent in human culture since the earliest days, as evidenced by their appearance on religious cave paintings (as in the Lascaux Cave in France) and their depiction in ancient Egyptian art, adorning sculptures and tombs of royalty. 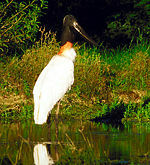 Egyptians also included birds among their gods, and the ibis was often mummified and placed in the tombs with royalty. Birds are also prominent in the Bible, with over forty species of birds mentioned. In the book of Job (39:26-27), there are references to migrating birds: "Is it by your wisdom that the hawk soars and spreads his wings toward the south?" and the ways of eagles: "Is it at your command that the eagle mounts up and makes his nest on high?" Likewise, in Jeremiah (8:7) migration is also noted: "Even the stork in the heavens knows her times; and the turtledove, swallow, and crane keep the time of their coming." In Chapter 15 of Genesis, Abraham is depicted as making an offering to the Lord that included a turtledove and a young pigeon, and later birds of prey are depicted as coming down on the offering. And it was a raven, and later a dove, that Noah sent forth from the Arc to see if the waters had subsided. Birds have also been depicted as powerful symbols in human culture. The dove is used as symbol of peace (with an olive branch) and the Holy Spirit in Christianity. Crows, and especially ravens, which are considered to be of high intelligence relative to many other birds, are often considered in legends or mythology as portents or harbingers of doom or death, because of their dark color or scavenger habits. 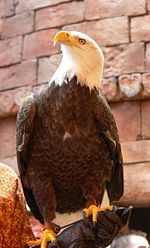 The bald eagle is a symbol of the United States, and cranes have been used in the East as representative of long life. Many species have become extinct through over-hunting, such as the Passenger Pigeon, and many others have become endangered or extinct through habitat destruction, deforestation and intensive agriculture. The passenger pigeon was perhaps the most common bird in the world, with an estimated five billion in the United States. They lived in massive flocks, with one flock estimated at two billion birds and taking several days to pass overhead. But passenger pigeons also were very popular for food and hog feed, and were shot in mass numbers by commercial hunters. By 1900, the last wild passenger pigeon was killed. 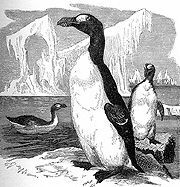 Likewise, the Great Auk, flightless rails, and the moa of New Zealand, for example, all became extinct due to human influence. The flightless dodo became extinct in the 17th century, largely because of animals brought by people that damaged the dodo's nests, as well as habitat destruction. Many parrots are endangered because of poaching for the pet trade, and habitat destruction, both by humans and by animals introduced by humans. The oldest known fossil bird Archaeopteryx, from the Upper Jurassic, is considered as one of the first "missing links" to be found in support of evolution, after the first fossil specimens were found in the late nineteenth century. However, it also presents a complication for the dinosaurian theory. Archaeopteryx lived some 145 million years ago. Eminent evolutionist Ernst Mayr (2001) notes that this species has so many advanced avian characters that the original birds much have existed considerably earlier. Yet, there have not been any birdlike dinosaurs known from the Jurassic or earlier periods. The most birdlike dinosaurs occurred in the Cretaceous period, well after Archeopteryx disappeared. There are other complications that Mayr lists, including that the digits in the hands of dinosaurs are two, three and four, while they are one, two, and three in birds, and that it is inconceivable how the extremities of birdlike dinosaurs could have been shifted to flight, being reduced and not pre-adapted to become wings. The recently discovered dromaeosaur, Cryptovolans, appears capable of powered flight, contained a keel and had ribs with uncinate processes. In fact, some consider that Cryptovolans makes a better "bird" than Archaeopteryx, which is missing some of these modern bird features. Because of this, some paleontologists have suggested that dromaeosaurs are actually basal birds whose larger members are secondarily flightless, i.e. dromaeosaurs evolved from birds and not the other way around. Evidence for this theory is currently inconclusive, but digs continue to unearth fossils (especially in China) of the strange-feathered dromaeosaurs. It should be noted that although ornithischian (bird-hipped) dinosaurs share the same hip structure as birds, birds are actually considered by many paleontologists to have originated from the saurischian (lizard-hipped) dinosaurs, and thus arrived at their hip structure condition independently. In fact, the bird-like hip structure also is speculated to have developed a third time among a peculiar group of theropods, the Therizinosauridae. Ketterson, E. D., and V. Nolan. 1994. Male parental behavior in birds. Annual Review of Ecology and Systematics 25:601-28. Zeveloff, S., and M. Boyce. 1980. Parental investment and mating systems in mammals. Evolution 34(5):973-982. This page was last modified on 15 September 2016, at 15:36.